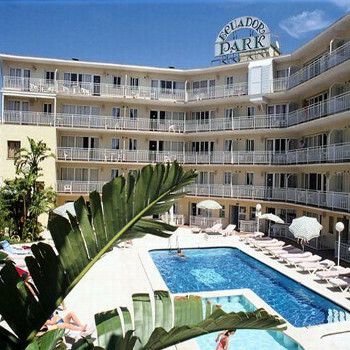 The two key Ecuador Park Apartments are situated in a quite location (on the Benalmadena side of Torremolinos), yet only 50 metres from a wide selection of bars, shops and well known landmarks. The beach is within 100 metres walking distance. Apartments spotlessly clean, everything you require for a short stay. Very spacious rooms, nice swimming pool, 24 hr reception near to all amenities, cleaned every 2 days. Had to buy small kettle as only a percolator in room which was not up to much would advise you to do the same or take your own if you like a hot drink in the morning. Apart from that could not really fault this accommodation at a good price ideal for short stays etc. These apartments were ideal just 150 meters from the beach. Bars and restaurants aplenty. They were spotlessly clean and the maids came in every other day. The rooms are bright and airy and of a nice size. Twin beds in the bedroom and a fold down double in the living room. There was a nice big balcony to all the apartments and the kitchen was fitted out with four ringed cooker, microwave, toaster and coffee maker. There is a heater for the colder nights but no air-con for warmer nights. All in all these are great apartments.